The Yugoslav film-club platforms, which emerged in the late 1940s, were soon to become a catalyst for cinematic experimentation and the challenging of mainstream aesthetics and ideas, as a springboard for the great directors of the country’s Underground and oppositional cinema. One of the few still existing film clubs of that era, the Akademski Filmski Centar (AFC), facilitates a case study of the Amateur Film Movement in Yugoslavia and its role in the development of experimental film, while it allows us to take a closer look at some Serbian idiosyncrasies in this field. Not unlike their wealthier Hungarian equivalent, the Bela Balazs Studio, the Yugoslav film clubs were an institution. Through Tito’s implementation of “popular technological education” they were initially funded, later partially funded and finally left to their own devices. Whereas in Hungary a centralized, relatively well funded Studio served the purpose of ambitious semi-professional experimentation, but was closely observed and heavily censored, the Yugoslav film clubs were de-centralized and unequipped, but much more accessible and much less scrutinized. While several clubs served their original purpose of harmless “home video” productions throughout their existence, they also played a key role in the development of an Amateur Film Movement by attracting several individuals with oppositional opinions. Soon, some clubs developed strong theoretical interests. In Serbia these were the Kino Klub Belgrade and the AFC. Most of the instigators of the Black Wave movement, such as Kokan Rakonjac, Živojin Pavlović, Želimir Žilnik and Dušan Makavejev, made their first contact with the medium in these two amateurs’ clubs. The first domestically produced film that was banned in Yugoslavia, as it depicted Partizans in a negative manner, was Tears (Suze, 1959), a Belgrade club film by Rakonjac. One of his AFC films that followed and is presented here, Wall (Zid, 1960), is less direct, equally political but more poetic and delivers the morbid, existential angst that would characterize his work. Filmmakers of the “first guard” of the film clubs, like the ones mentioned above (with the exception of Žilnik) showed influences of the French poetic realism and impressionism, of surrealism and even Soviet montage, like Smoke and Water (Dim i voda, 1962) by Dragoslav Lazić, which is a well executed example of these tendencies. Sava Trifković’s Arms in the Purple Distance (Ruke ljubičastih daljina, 1962), combined Rakonjac’s morbid pessimism with moody imagery and early optical printing techniques. The film received the main prize at the prestigious Unica national competition of amateur films but Trifković never managed to finish another project. He was the quintessential amateur of the film clubs; an unemployed architect who never really pursued a film career but remained a valued member of the Belgrade film clubs. While the Serbian clubs in Novisad and Belgrade were pushing the political envelope and explored narrative innovation, the film clubs that had developed in Ljubljana, Zagreb and Split were becoming aware of the new global tendencies in experimental film. Zagreb’s GEFF was by 1963 one of the most comprehensive avant-garde festivals worldwide and had a huge impact on the film clubs’ filmmakers all over Yugoslavia. Tomislav Gotovac arrived in Belgrade from Zagreb and made 3 films at the AFC. In Circle (Kružnica, 1964) he planted the camera on a rooftop and rotated it constantly on its axis, thereby creating a highly conceptual work for its time;similar to Michael Snow’s Central Region, but predating it by some 6 years. By the mid-60s, the first occupants of the Belgrade film clubs had founded their own production companies and remained quite unaffected by the structural and material films, which were slowly gaining momentum in other parts of Yugoslavia. Kino Klub Belgrade closed in 1964 and AFC vegetated for several years until a new generation of filmmakers emerged at the end of the 1960s. The strong influences of GEFF’s revelations were evident in the majority of the works produced in the ‘70s, like in Croatian Vjekoslav Nakić’s structural film Composition (Kompozicija, 1970), or Milenko Jovanović’s The First Picture of Me Ever Taken (Kako su me prvi put fotografisali, 1971) which, besides titles and credits, runs at the minimal duration of just one frame. Nicola Djurić’s Vowels(Samoglasnici, 1973), an ode to Arthur Rimbaud with Lettrism references and Radoslav Vladić’s House (Kuća, 1977), a conceptually structured portrait of his own home, followed in the same spirit. Vladić, today one of Serbia’s most accomplished professional cameramen, is also one of the most prolific experimenters of the AFC. House is typical of his personal style, always focused on his close environment of family, friends and familiar objects. Miodrag Milošević, yet another cameraman like Vladić and Djurić, had by 1977 become the director of the AFC, and together with previous director Ivko Šešić has managed to keep it alive and active as an archive and an amateur production house to this day. Milošević’s own work, like And Was Evening and Was Morning, the Seventh Day (I bi veće, i bi jutro, dan sedmi, 1975), demonstrates a kinship to the works of the Black Wave directors, not in style but definitely in his subjects of class, representation and sexuality. Organon, They Asked Me To (Orgonon, tražili su od mene, 1980) by Zoran Saveski was also an example of that middle ground between pure abstract cinema, that had reached excellent levels in the Croatian and Slovenian film clubs, and the narrative films of opposition that were still in their heyday in Serbia. Another member of this group that dealt directly with sociological issues was Bojan Jovanović, an ethnologist whose ambiguous and highly stylized criticism of media in Holiday (Praznik, 1985) does not exclude the experimental film. Miroslav Bata Petrović is one of the most dedicated members of the Serbian film clubs’ experimental film sector and remains a prime mover, writer and organizer of events to this day. As a filmmaker, he worked across a wide range of styles and his collaboration with Juliana Terek, Personal Discipline (Lićna disciplina, 1982) gives one of the earliest examples of punk aesthetics in Yugoslav cinema. The act of shaving one’s head, which is what Terek does here, was a symbol of denunciation of the army in Yugoslav film but not one often performed by a woman. 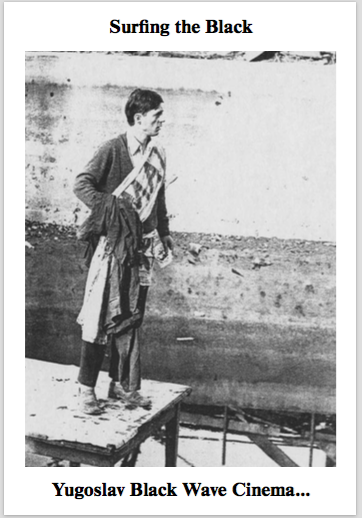 Whereas Lićna Disciplina is a straight forward documentation of Terek’s performance, in The Effects of Earth`s Gravity on Naive Beings (Dejstvo zemljine teže na naivna bića, 1985) Petrovic conveys his pessimistic message with a wide range of formal effects of the image and the sound. This film was produced at the Amateur Film Club of House of Youth Belgrade (Amaterski Filmski Klub Doma Omladine Beograd) and not in the AFC. Another occasional resident of the Klub Doma Omladine was Slobodan Mičić, a maverick filmmaker who contributes two very exciting experiments to this program, Open Work (Otvoreno delo, 1980) and Contemporary Man (Savremenik, 1981). These two works have managed more than any in this selection to combine the aesthetics and formal characteristics of the new avant-garde tendencies with the humor and the themes of the narrative shorts and features which developed in the Serbian productions of Black Wave.